What Can A Drum Student at Brooklyn Music Factory Expect to Learn? 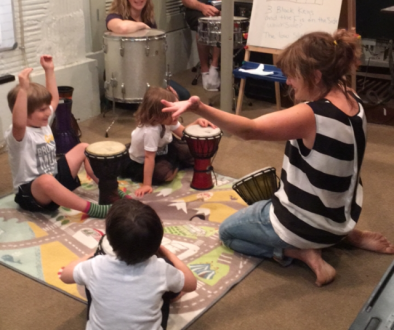 What do students learn in Drum Lessons at Brooklyn Music Factory? Consider This: We take your brain, split it into four individual entities and assign each one a limb. Now we add an array of tasks to each unit – such as rhythmic fluency, dynamics, varied tempos and pattern recognition; finally, we put your brain together again, and you play drums with a smile on your face. Sounds Crazy? Drum Lessons at The Brooklyn Music Factory focus on 4 Way Independence and music fluency. What do we mean by this? Well, four way independence can be thought of as technique or the physical relationship to the instrument. The term “physical” being paramount in this case, since playing drums is essentially an athletic activity requiring LOTS of body awareness and intense control. We’ll help you get in shape, improve stamina, and raise your awareness…all needed to steer the ship and communicate with other musicians in a band. Learning the architecture of the instrument: Hitting the right drums in the right place, high VS low sounds, cymbals vs drums, feet vs hands. Learning how to get a quality sound out of the instrument (soft vs loud…crescendo vs diminuendo). Ultimately, learning how to keep your body ‘in shape.’ Every day. Every week. And ready for every gig. And fluency can be thought of as learning the language of music. Or building vocabulary, structure, and growing comfortable & confident communicating with others. Learning how Beats, rhythm and patterns all work together to create a musical drum part that fits with the rest of the group. Learning to break down song form through both listening and counting. Ultimately, internalizing the length of sections by feel (4 Bars vs 8 Bars vs 16 Bars, etc. Doing extensive Rhythm Training. Rhythm Training applies to absolutely everything we do on the instrument. Rhythm Training is like understanding all the math behind music construction…students start with Quarter Notes (1,2,3 & 4) and build up from there until they can identify and play 8th Notes, 16th Notes, Triplets, Straight vs Shuffled Feels. Learning how to read basic Drum Notation (the type of notation used primarily for pop, rock and jazz). Learning how to listen beyond the drums, identify all the other instruments in a band and use them for a drummer’s musical cues. 5 Minute Warm Up:An Improvised and timed musical conversation on drums, piano, voice, or even body percussion. 10 Minutes of Skillz & Drillz:This is all about building technique on the drums as it applies to the student’s gig song (what they will be playing with other musicians at an upcoming performance). 5 Minute Weekly Goal Review:Every student has one weekly music goal and this is when it gets tested. The student and teacher play through the weekly goal and then ask the question, ‘did we achieve our weekly goal?’ The teacher & student keep track of Yes/No every week, all year and parents receive a monthly report. 10 Minute Song Work: This is when the student works on reading and playing songs out of their book or from BMF lead sheets of pop, rock, jazz songs. 5 Minute HomeRock Review: HomeRock is what we call our Lesson Notes. Every student has a HomeRock binder that holds weekly lesson notes + all support materials. At the top of the HomeRock is the student’s weekly goal. The HomeRock is also emailed to parents every week. Rhythm:Groove is paramount to any musician’s success. Students study hearing and reading rhythmic notation (in all its divisions, sub-divisions & combinations), as well as how to actually apply them to Rock and Pop music. Melody: Students learn to hear and analyze the contour and logic behind melodies. They study intervals (the distance between two notes) and how a melody is a combination of steps, skips and leaps within a major or minor scale. Harmony: Students build a working knowledge of chords and how they are combined to create progressions. Beginning BMFers start by working with chords start as three notes known as triads and over the next ten years grow a working knowledge of extended pop & jazz chords. Lyrics/Form/Composition: Composition and improvisation are a HUGE part of what we do at Brooklyn Music Factory. Students work from the very first lesson on growing confident expressing themselves in the language of music with our totally improvised duet, we call this the5 Minute Warm Up.As well, students learn that songs are made up of a clear structure with lyrics driving the melodic and harmonic rhythm. Students dissect the importance of words and how each syllable has implications in the entire band. By midway through middle school, all of our students are challenged to start composing. Each year we feature ten original private lesson student compositions on an album release through BMF Records. Please feel free to email or call with further questions. Learning and making music is a life long journey that requires both a community of supporters as well as mindful & attentive mentors every step of the way. While it may be easy to believe that the great musicians were ‘born with talent,’ the truth is anything that is worth doing takes true commitment, work, and a whole lot of help staying on the right track.